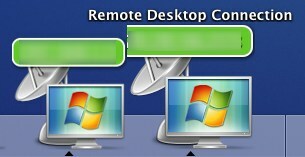 Microsoft yesterday released Remote Desktop Connection 2.0 Beta for Mac OS X. This is the first release since 2002. The current version was really old, clunky and limited compared to it’s Windows counterpart. Worse was the fact that it was PPC native and was never turned into a Universal Binary, making it just that much slower. This is a really welcome upgrade for all Mac users in a PC environment. Unfortunately it’s still missing key things, but it’s still beta so there is still hope. I’m primarily a Mac user at work, but do work on a few PC’s as well, so I have RDC running constantly since I find it easier than hitting the KVM switch all the time. 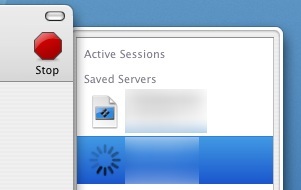 No, I don’t use Parallels as of yet. This works pretty well for most tasks, but on occasion when I need to do more intensive PC work I do switch over using the KVM for the time being. Because I work like this, I switched to CoRD, which is an open source Remote Desktop implementation. I’d highly recommend it. It’s very good. RDC 2.0 has a really nice new look, and much improved performance for Intel Mac users. It does however have some issues that still aren’t addressed. Notice in the menu above, you can’t make a “new” connection. Only open a saved one. I can’t for the life of me understand why this is. Do I really have to plan my connections in advance? What if I’m connected to a computer and want to quickly connect to another? The only way I can find to get a prompt for a new connection is when you don’t have any connections open. This just doesn’t seem right. With CoRD I can easily add a new RDC connection using the quick connect box, or by adding it to the tray. This is in my opinion essential functionality. It’s so easy to manage connections in CoRD. IMHO it’s the greatest feature this application provides. Having multiple connections open in RDC 2.0 gives multiple dock icons with the address of the host in the icon. A rather nice way to tell who you’re connected to. There is a bug however which results in one looking cut off on my PPC Mac Mini, not sure about the Intel one (maybe lack of Core Image support at fault?). One downside to this design is that the dock can get pretty cluttered quickly if you have a few connections open. But in my case it’s never really more than 2, so it works well for me. CoRD uses a “tray” like interface for managing connected an saved connections. This means no connection files sitting all over your computer (yay!). It also means switching between connections is really easy, even if you had a dozen, and it doesn’t clutter your dock. It’s great interface. New to RDC 2.0 is Full Screen mode. Something that was missing in prior versions (and really hurt). CoRD also has this feature. This is one place where both applications have shortcomings. In RDC 2.0, if your resolution isn’t ideal for your display, it crops and looks really poor. In CoRD if you are using a windowed view, and go full screen, it disconnects then reconnects to go full screen. This is a real drag. There is however a workaround for CoRD. The trick is to start full screen and exit if you want to use it windowed. CoRD then seems to scale down the resolution but maintain the same connection. Despite scaling the fonts are still very readable. I don’t think CoRD can map drives though. That’s a pretty nice feature. Overall I think I’ll be using both applications depending on the tasks at hand, but I think I still prefer CoRD. For anyone wondering, Entourage on an Intel Mac isn’t bad. Can’t wait for the next release where everything is a Universal Binary. PowerPoint is dead to me until that upgrade. Is it possible to run http://www.rdesktop.org under Mac OS X ? But it would certainly have very poor integration.